We’ve been eating lots of fresh organic local produce recently. 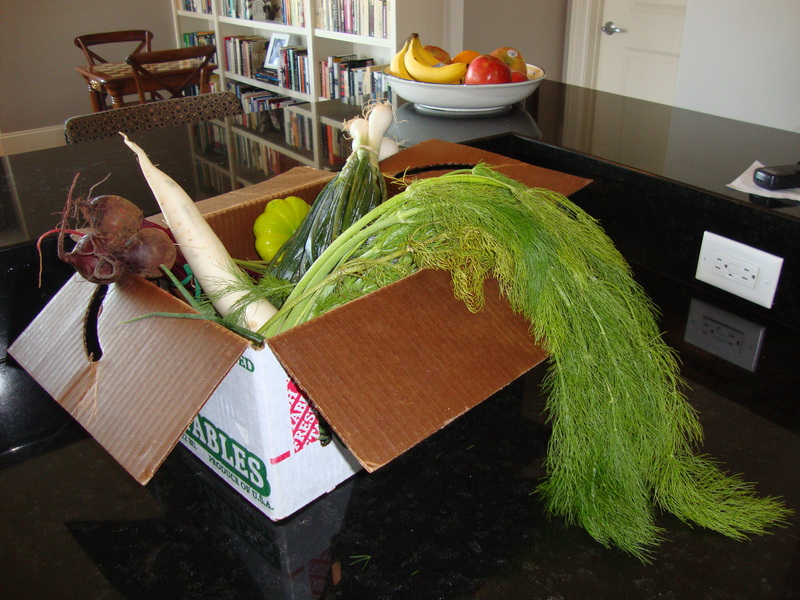 Sally subscribed us to the Mid-Chatham Farmers’ Alliance CSA (Community Supported Agriculture), which furnishes a box filled with fresh produce once a week through the local growing season. The food has been amazing! There’s so much taste! Even some vegetables that I’ve long avoided, based on bitter early encounters, like beets and turnips, have been remarkable. With the various greens, I’ve made some fantastic green smoothies. I was momentarily cheered when Red Hat served veggie hot dogs at a gathering this week. I appreciated some recognition of plant-food eaters, but when the crucial moment came, I couldn’t get myself to try one. I’ve gotten used to eating very little processed food, and now the idea of snacking on man-made chemicals is sort of disturbing. As it happened, I wasn’t very hungry anyway. There was an interesting New Yorker article titled Snacks for a Fat Planet: PepsiCo takes stock of the obesity epidemic by John Brooks a couple of weeks back. Did you know that PepsiCo is the largest food company in the US, with $60 billion in annual revenues? Its Frito-Lay division is by itself enormous, and other brands include Tropicana and Quaker Oats. Its CEO, Indra Nooyi, is the first female, first Hindu, and first vegetarian to lead the company, and she sounds like a brilliant and dynamic leader. She also seems genuinely concerned about the health problems that are associated with some of the highly processed sugary or salty foods that have made PepsiCo vast quantities of money. I don’t envy her, for she’s taken on an impossible job. It’s nice to work on making the fatty snacks on which PepsiCo has thrived less unhealthy. But the whole business of not only engineering snacks but also programming people to eat more and more processed junk is wrong. It contributes to vast numbers of premature deaths. Our junk food culture is like the smoking culture, but before the Surgeon General’s report in 1964. We’re done something (though not enough) to address the health risks of tobacco, and we need to do at least as much to address the deadly culture of junk food. I realize this message is kind of depressing, and junk food purports to be, and is accepted as being, innocent fun. But that’s, in part anyway, the problem.